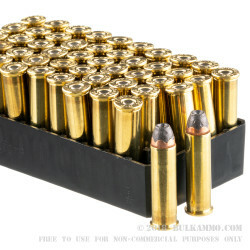 A substantial 357 mag ammo for a good price and without the usual recoil and snap of rounds coming out of a .357 Magnum. 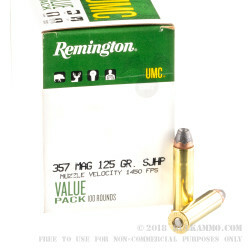 This is a low priced Remington UMC cartridge that offers a very good price point for those wanting a versatile and fun to shoot round for their .357 Magnum firearms. A 125 grain projectile coming out of the muzzle at 1450 feet per second and offering more than 580 ft. lbs. 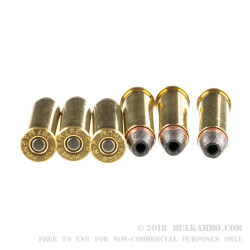 of energy, is definitely suitable for target, self defense or hunting, but this ammunition is best suited to general range use and as a backup for self defense purposes. It has a slightly milder recoil profile than other regular power .357 Magnum loads and presents a relative value in the realm of .357 Magnum ammunition. This classic UMC round by Remington has for decades been a venerable option for any type of use that a .357Magnum is suitable. It has no real contenders in the mid-range, non-specialty segment of the .357 ammunition market even now. What should be obvious is the value presented by this round, given its rich history of producing results regardless of the specific need of the shooter.